To see the full connection map with explanations click here – Solodov and his connetions. The long arm of Moscow or just a business? The First Baltic Channel (PBK) is the most popular Russian television channel among the Baltic Russians. At the start of the year, the channel’s total audience in the Baltics exceeded four million viewers. Audience data reveals that it’s not just Russians who prefer Alla Pugacheva’s concerts, but often Estonians and Latvians as well. Currently the goal of PBK’s parent company Baltic Media Alliance (BMA) is to become the leading media holding company in the Baltics, and it’s a very realizable goal. It’s not only because the national media in the Baltics isn’t offering content of equal value in the Russian language, like PBK is doing, by re-telecasting Russia’s TV channels. It’s also because PBK is ready to serve the needs of leading politicians to fill its coffers. For example, by coordinating the content of its news with Riga Mayor Nils Usakovs, or the topics of its programmes with Tallinn’s politicians for the telecasts paid for by the city council. 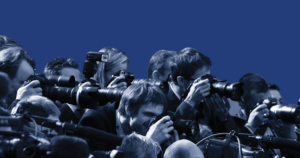 Re:Baltica undertook an investigation, in Latvia and Estonia, of the ownership of the influential media concern with more than ten associated companies in the Baltics, and the secret of the company’s success. 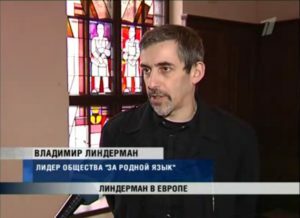 „We don’t like him,” PBK journalist and news producer Natalija Vasiljeva explained in very good Latvian, as to why radical National Bolshevik Vladimirs Lindermans hasn’t been shown even once on PBK news this year. That’s her counterargument to the claim that PBK spreads Moscow’s ideology. Such inferences have been made time and again in the Latvian media. The channel has been called a „mouthpiece of the Kremlin”, „Russia’s propaganda” and has been accused of being „politically engaged „. Vasiljeva looks a bit offended about the accusations, stating that „PBK is a business project”. „We show what our viewer wants to see”. She has worked at PBK for three years now. For eight years prior to this, she created stories about events in the Baltic countries for Russia’s First Channel. PBK was created ten years ago using this channel as its basis. What the PBK viewers want and what they need is decided by Vasiljeva and the journalists from her news team. In Latvia these are ten contracted correspondents, whereas in Lithuania and Estonia the news is prepared by groups of independent producers. PBK’s business is relatively undeveloped in Lithuania, as only 5% of the people there are Russian. 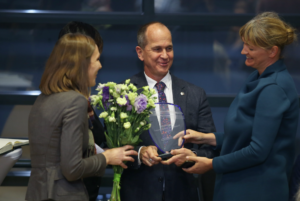 The business is much bigger in Estonia, where in the last two years, PBK has received a commission from Tallinn’s City Council for almost half a million euro. In Latvia, PBK has significant advantages over the national channels. Firstly, it doesn’t have to waste huge amounts of money for original programmes, as about 70% of its content is made up of Russia’s First Channel and REN TV programmes. The remaining 30% is made up of films which they purchase, the morning programme, the evening news and, they create the weekly “We in Europe” programme for the 30 thousand euro provided this year by the European Commission. Another advantage — PBK telecasts over cable networks and using a satellite, and therefore doesn’t have to pay for terrestrial telecasting, which costs the national channels more than half a million lats each year. Consequently, PBK is in a much more favourable position than the LNT or TV3 commercial stations. They compete in the market for advertising with much smaller costs and also make money from cable operators for showing their programmes, which the national channels aren’t allowed to do. PBK is a serious player. In January it was the second most watched television channel in Latvia. TNS Latvia data shows that viewers watched it only slightly less than market leader TV3. Media advertising experts estimated that in 2011, the BMA media holding company had about 30% of Latvia’s TV advertising market, or around 7 million euros. The company’s latest annual report has still not been lodged, but in 2010, its turnover in the Baltics was 15,6 million euros. Half of its earnings were derived from Latvia. BMA also has an associated company registered in Great Britain — Baltic Media Alliance Ltd. Data from Great Britain’s company register shows that, that BMA doesn’t operate in that country, but has taken out a telecasting licence for three of its channels (REN TV Baltic, Mir Baltic and First Baltic Music Channel). The main channel’s — PBK’s licence was taken out in Latvia so that it could show political advertisements, which are not permitted by a British licence. In turn the British licence also has another advantage — language restrictions don’t apply to it and the content shown in Latvia doesn’t have to be translated into Latvian, as is required by a national telecasting permit. There could be an extra significant reason for the company’s registration in Great Britain — the desire to save on taxes. A common practice for Latvia’s businesses is to register firms in London, which are in actual fact shells, where payments for services are sent, to reduce the amount of income tax. The BMA office in Latvia wouldn’t comment on the kind of transactions undertaken by the London registered firm. But, its turnover in 2010/2011 was impressive — about half of BMA’s turnover in the Baltic, or around 9 million euros. Just business, no ideology — say Saeima members Sergej Dolgopolov and Boriss Cilevics from the leading Russian party in Latvia – Harmony Centre on PBK’s formula for success. Producer Vasiljeva also emphasizes neutrality. For example, PBK showed members of all parties in the Saeima before the Russian language referendum at the beginning of year. The longest discussion was with the Speaker of the Saeima, Solvita Aboltina from Unity, but PBK viewers criticized them afterwards in Facebook comments, saying — it would have been better to show other politicians, those who can be trusted. It’s not surprising that Aboltina bores PBK viewers, as charming Riga Mayor and HC leader Nils Usakovs appears on the channel almost every day. Before the local council elections in 2009, PBK provided reams of information about the activities of the non-profit organization 9.May formed by Usakovs with the goal to support war veterans. The information was so huge leading one to guess what the channel cares more about — war veterans or Usakovs’ political career. PBK’s loyalty to Usakovs, who previously headed up PBK’s news service, was so great that the television channel even agreed on the texts of stories with him. This is revealed in Usakovs’ stolen e-mail correspondence, the authenticity of parts of which the Mayor questions. But the result doesn’t raise any doubt — a huge celebration took place on the 9th May, 2009, by the Victory Monument, and a few months later Usakovs celebrated an overwhelming victory in the Riga City council elections. A year later, HC got the winning double, as prior to the 10th Saeima elections PBK completely ignored Usakovs’ party’s main rival, For Human Rights in a United Latvia, which was wiped out by the voters. PBK news producer Natalija Vasiļjeva says that she has known Usakovs for fifteen years already and that it’s quite normal that they sometimes ring each other and talk things over. In addition, PBK, as a private channel, is only interested in profits, and that’s why they show who they like and those who are friends — sufficient objectivity is maintained if they sometimes show other points of view as well. As an example, Vasiļjeva mentions the USA, where TV in each state shows what the owner likes. PBK news takes a wider view. „We’re all friends” explains Usakovs in a similar fashion. He says he doesn’t control the stories, but „informs” the media. It appears as if this “informing” is continuing. PBK is already showing the organization’s 9.May advertisements, inviting one to make a donation to war veterans and soon there’ll be a celebration again by the Victory Monument. Many Latvians recognize the head of the largest national TV channel LNT Andrejs Ekis or community television chief Edgars Kots, but only a few know who owns PBK. Very little has been written in the Latvian press about Oleg Solodov (46), the owner of BMA, the second largest media concern in Latvia. The Google search engine only shows Solodov’s business interviews and the news that he parked his huge Jeep in an invalid parking spot at the Sky department store four years ago. Old press articles show that Solodov began his business activities in 1993 with the Olevs—Invest finance company, which he established with a Russian citizen from Ufa. Soldov himself is also from Ufa, and finished high school there in 1983. He arrived in Riga to study to become a flight dispatcher. The Bizness&Baltija newspaper wrote that the Olevs—Invest company’s licence was revoked in 1995 for not complying with its obligations and the falsification of financial records. According to Rīgas Balss, criminal proceedings were instituted against its Director, Solodov, at the end of 1995, based on the submissions of a number of depositors and owners of stocks in the Olevs Fondi company. „The company isn’t paying out its promised percentages on deposits, or stock dividends. (..) At the beginning of 1995, the company’s operation was suspended for a period, as it was suspected of dealing with forged certificates. The company also declared huge half-yearly turnover sums (around 1 million USD) and mentioned a high profitability percentage”, according to the newspaper. Rīgas Balss drew parallels with the infamous Russian financial pyramid MMM and Olevs used well known movie stars — Ivars Kalnins and Arnis Licitis in its advertising clips. Re:Baltica was unable to clarify how the criminal proceedings went, as the Prosecutor’s Office was unable to locate the matter. The current Minister for Justice, Gaidis Berzins who was the company’s administrator in 1997 was also unable to recall the outcome of the matter. Press archives show that in September 1997, the Riga Regional Court declared it bankrupt. Neatkarīgā Rīta Avīze newspaper wrote that none of the representatives of the company turned up for the court hearing, as the „responsible company officials had disappeared. 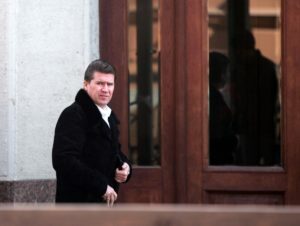 (..) The only thing known about the head of the Latvian and Russian joint company Olevs—Invest, Oleg Solodov, was that he was outside of Latvia.” The article also mentioned that its accountant, Nadezda Galkina also couldn’t be found. A woman with the same name and surname now appears on the BMA home page on the management team as the accountant. Lursoft data show that in the mid nineties Solodov not only built financial pyramids, but also his media business. The TEM ART Group joint stock company which was registered in 1995, began placing Latvian advertisements on Russia’s ORT community television station. How Solodov and his partners acquired this profitable business is one of the black holes in his biography. In the early nineties, the rights to re-telecast ORT belonged to Rezekne BIK TV Community Television. In 1998, a battle began between BIK TV and the TEM ART Group representing Solodov. Solodov’s company announced that it alone, had the exclusive rights to re-telecast ORT, whereas BIK TV maintained that it too had these rights. 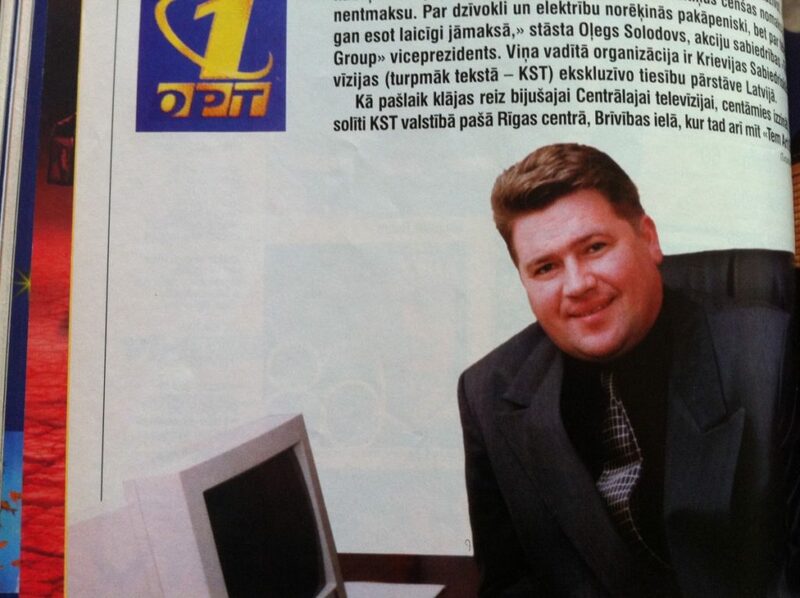 A month later when the dispute came before the National Radio and Television Council (NRTC), BIK TV owner Peteris Burmistrovs suddenly became ill and died of a stroke at the age of 48. Re:Baltica was able to establish that the NRTC really had received a letter of confirmation from ORT, and that Solodov’s company had been given the re-telecasting rights. How they got them, however, is a mystery. In Russia, to start a profitable business you need powerful backing, and ORT was under the control of oligarch Boris Berezovsky, who was close to President Yeltsin. After Putin’s coming to power, Berezovsky was squeezed out of television in 2000 and the Kremlin took it over with a vice-like grip. How difficult it is to develop these business links, is acknowledged by Baltkom TV, which was „screwed” by the Russians. Peteris Smidre, the head of Latvia’s largest cable television company at the time tells us that in the mid nineties he travelled to Moscow to meet with ORT vice-president Badri Patarkatsishvili, a close ally of Berezovsky, to obtain exclusive re-telecasting rights. The discussions were going very successfully and Patarkatsishvili asked him to return in a few hours — when the contract would be ready. When Smidre returned to the office after a stroll around Moscow, Patarkatsishvili and his team were gone, and the deal came to nothing. Solodov established PBK in 2002, but four years later the parent holding company, Baltic Media Alliance, was registered as well. Solodov also owns two companies dealing in real estate — VillaRiga and Villajura. Solodov shares ownership of the BMA holding company with Russian resident Alexei Plyasunov (44). Little is known about him — born in the Pskov Region, he lives in Moscow and is a member of the Spravedlivaja Rosija political party. He was a parliamentary deputy in the Pskov region as a representative of this party and in the Velikiye Luki City Council. Russian data bases show that he worked for a security firm at the beginning of 2000, but in 2007 Plyasunov indicated his place of work as the Panoil company. In Latvia, PBK employees say that they know nothing about the joint owner of BMA, and have never seen him. Solodov leads his media empire by himself and, it appears, in quite a authoritative way. 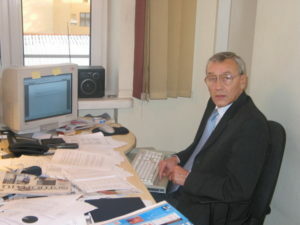 The intense level of control was even the reason why MK — Estonia newspaper’s editor-in-chief Pavel Ivanov left his job. He says his former employer is smart, able to make quick decisions, but the tight supervision from Riga had been rather burdensome. The MK — Latvia and MK — Estonia weekly newspapers in the Russian language are another success story for BMA. MK — Latvia is the most read paper in Latvia with an audience of 170 thousand. Solodov himself is also involved in maintaining political friendships and attracting political advertisements. He personally keeps in touch with his former employee Usakovs. Former BMA lawyer Vadim Baraņņik has also obtained an influential (and lucrative) position on the Riga City Council, and is now a member of the Riga Traffic Board and Chairman of the Council’s Transport Issues Matters Committee. Last autumn, the former editor of the Moscow Komsomolskaja Pravda newspaper, Oleg Samorodnij released a book in Estonia about how Moscow was waging an information war in all of the Baltic countries. The goal was to integrate the local Russians into the Putin controlled Russian media world. The journalist was of the view that decisions about supporting a specific party wasn’t being made by the editorial board. „I don’t think that the decisions are being made by PBK in Estonia and I also don’t believe that decisions in Riga are made by BMA. I think that these decisions are being made in Moscow,” said Samorodnij. 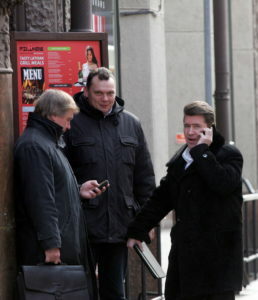 In his opinion, Usakovs’ entrance onto the political stage is a striking example — the former ITAR — TASS Russian news agency’s correspondent in Latvia, and later PBK’s news editor could be seen daily in the news prior to the elections as the only saviour of the Russian speaking community and with the support of PBK, became the Mayor of Riga, the largest city in the Baltics. Is the picture really that clear? It looks as if a substantial motive was a mutual advantage in the expression of money and power. After the change in power in the council in 2010, the Riga City Council’s Rigas nami enterprise transferred 43,560 lats to BMA’s company Baltic Media Advertising, ostensibly for advertising of the enterprise on TV channels. However, Karlis Kavacs, chairman of the board of the enterprise was unable to give an answer on what was being advertised. A year earlier, Janis Lacis, the long time head of management at Rigas nami was released from his position, as he refused, under political pressure, to amend the enterprise’s budget and to increase advertising expenditure to 120 thousand lats a year. Usakovs’ press secretary provided Re:Baltica with information that PBK was given 10,000 lats last year from the Riga City Council’s budget for advertising. It should be added that a similar sum was also given to Latvijas Radio, but LNT and Diena — an average of 15,000 lats, to publicize activities within the city. Solodov has been much more successful in attaching himself to the flow of tax payer money in Estonia, or — maybe just more visibly. BMA has close ties with the Centre Party there, whose leader Edgar Savisaar, is Tallinn’s Mayor. Estonia doesn’t have distinct „Russian parties”, but the Centre Party attracts Russian speaking voters like HC does in Latvia. In Estonia PBK has four programmes which it produces itself. Three of them have been paid by the Tallinn City Council for years. Two years ago it came into public that the cost for three programmes currently is 0.4 million euro per year. The fourth — the news — is created by a company which also creates advertisements for the Centre Party. Tallinn City’s press secretary and Centre Party member Lev Vaino says that all important questions (topics for telecasts and hosts) are coordinated directly with Riga, with Solodov. Money for telecasts in Tallinn is paid to the Riga office as well. 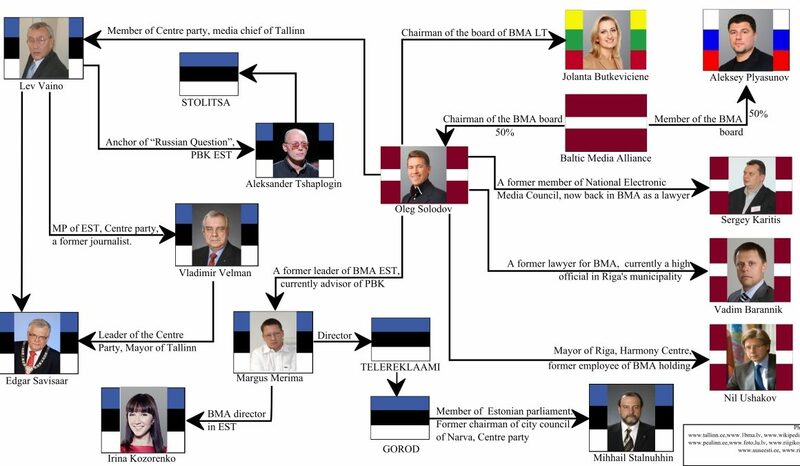 „You know the old saying — he who pays the piper, calls the tune” says Margus Merima, who headed BMA’s business for more than ten years in Estonia, about the Centre Party politician’s frequent appearances on PBK. He stepped down from this position in 2009 due to health issues. But, as shown by documents found by Re:Baltica in Great Britain, Merima is a director of an associated company registered in England. Like his Latvian colleagues, Merima too denies that support for the Centre Party in Estonia is connected with Moscow’s ideology. PBK is not interested in politics — „only business”. Completely apolitical, only one politician can be seen among Merima’s circle of friends on social network Facebook among advertising business representatives and dog breeders (being the family hobby). Nils Usakovs. „What do you mean, the arm of Moscow! The cost of our licence in Moscow has doubled for us in recent years!” Oleg Solodov was upset by the question. Re:Baltica caught him at midday on the 4th April, at the moment when the expensively attired man came out of a meeting with broadcasting organization supervisor NRTC. For many months Solodov refused us an interview, as he believed that this article had been commissioned by his competitors. The meeting with the NRTC took place on the initiative of Solodov, as he wanted to be introduced to the new board. As observed by Re:Baltica, the discussions during the meeting were translated in the Russian language to Solodov by his press secretary. 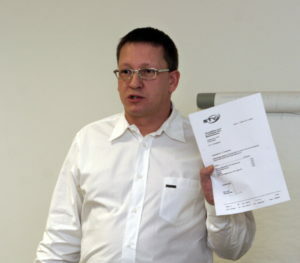 The presentation about BMA’s business was shown by Sergejs Karitis. He is the former lawyer for Solodov’s company and was elected to the previous NRTC as the HC candidate. At the beginning of the year he again sought a position on the Council, but after the extraordinary elections, the new coalition didn’t support him. Since the 1st March, Karitis has once again been working as a lawyer for Solodov, but the owner of the influential channel now has to personally establish contact with the new Council. „There were a lot of candid questions, but few candid answers” concluded Ainars Dimants, Chairman of the NRTC, after the meeting. For example, the Council wanted to know whether PBK could see problems with advertising HC in its news. He couldn’t see it. Does PBK’s contract with Moscow foresee that it is obliged to re-telecast Russian TV news programme The Time in Baltics? No, that’s not the case. The NRTC plans to meet with PBK’s management again after a month, when the channel’s „in-depth review” is finished — that is the Council’s current priority. As a show of PBK’s good will, discussions are taking place about the showing of Askolds Saulitis’ film “Sarkanais and brūnais” [Red and Brown] about the Latvian Legionnaires on the 8th May on the channel (a day before large celebration on May 9th).